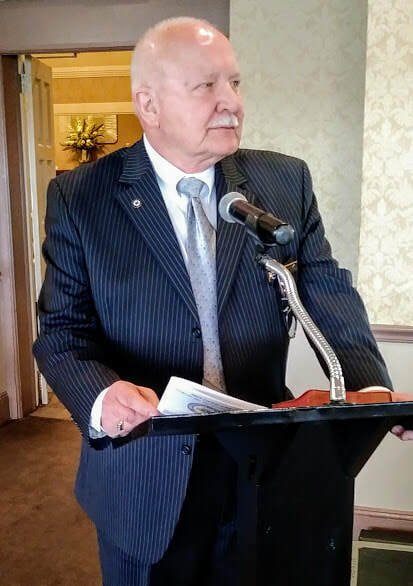 NEPTUNE, NJ – With the start of its 90th anniversary of volunteer EMS in the Garden State, the EMS Council of New Jersey (EMSCNJ) installed its leadership for 2019 during a ceremony Saturday at the Jumping Brook Country Club here. The 90-year-old nonprofit New Jersey State First Aid Council, doing business as the EMSCNJ, represents 20,000 EMS volunteers affiliated with 250+ EMS agencies throughout the state. Past President Charles Willer administers the oath of office to President Barbara Platt while her son, Kevin Kosarych, holds the Bible. Past President Mary Ann Ferrara reads the charge of office to executive vice presidents (L-R) Bryan Platt, John Butterweck and Tarcisio Nunes. Past President Howard Meyer read the charge of office to secretaries Cyndy Reardon, left, and Paula Weiler. Outgoing President Joseph Walsh congratulates incoming President Barbara Platt. Representatives from the 24th District, including incoming Northern Area VP Tarcisio Nunes (center, standing), make an impressive showing.